Minimally Invasive Facial Procedure Achieves Great Results | Boris M. Ackerman, M.D. Many people are discovering that something can be done about the gradual loss of a triangular-shaped, youthful facial appearance, and the morphing into an older, square-shaped face. Dr. Boris Ackerman a Newport Beach plastic surgeon specializing in facial plastic surgery is one of the plastic surgery specialists in the country adept at performing a procedure called submental liposuction, which largely restores the more youthful triangular facial appearance. Quite often, as people become older and gain weight, unflattering fatty deposits develop in the face and the surrounding tissue loses elasticity, which obscures the more appealing features of youth. The traditional corrective approach to this kind of natural aging in the past has been the facelift, necklift, or both. Submental liposuction represents a less invasive strategy, and involves a significantly shorter recovery period, which is why it has become a very attractive option for newer patients. Technically known as microliposculpture, submental liposuction involves contouring of the area under the chin to achieve desirable facial re-shaping. Most often, between one and three very small incisions are necessary to accomplish the desired results, and these incisions can be located so they are virtually invisible. A talented plastic surgeon using this technique can achieve results comparable to those which might be expected from much more complicated procedures. Before any procedure is performed by a plastic surgeon, a prospective patient will generally be interviewed, and facial features will be examined. A patient considered a good candidate for submental liposuction would then be asked to participate in a ‘markup’ process, wherein fatty deposits are marked for removal, and incisions points are identified. The actual procedure is then performed while the patient is completely conscious, although under local anesthesia. The undesirable fatty deposits targeted in the initial examination are then carefully removed, without damage to other tissue in the area. 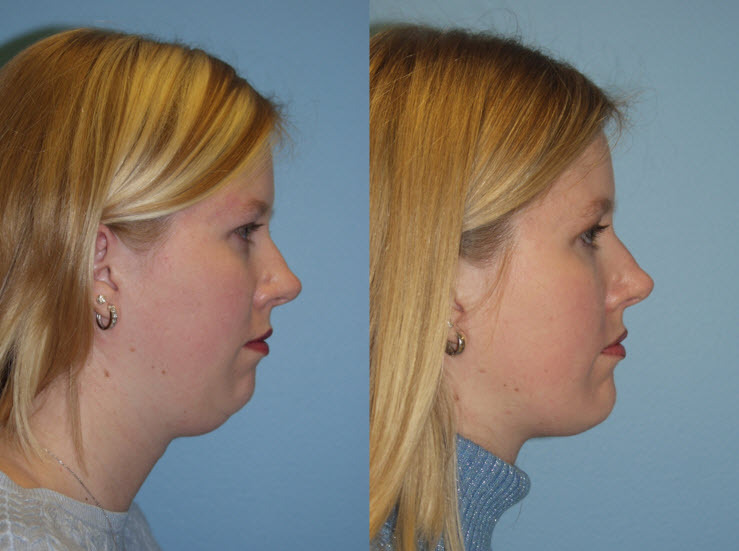 Whereas a necklift might require a week or more of recovery time for a patient, submental liposuction involves much less down time, and patients can return to work very soon after the procedure, if they choose to do so. About Dr. Boris Ackerman, M.D. Dr. Ackerman earned his undergraduate degree from the Massachusetts Institute of Technology in 1978, and his Doctorate in Medicine from the Dartmouth School of Medicine three years later. He is certified by the American Board of Plastic Surgery, and is a highly respected member of numerous professional associations. His practice in Newport Beach features a state-of-the-art outpatient surgery center, and is certified by the American Association for Accreditation of Ambulatory Surgery Facilities. He provides many types of plastic surgery procedures for patients, including facial rejuvenation, body contouring, breast augmentation, tummy tucks, and liposuction.